Refresher Class: This is a four-hour refresher class for technicians who want to take the EPA Section 608 Certification Test. The refresher class will review the knowledge needed to take the test and will be held prior to the administration of the test. This is a refresher class - not a training process. 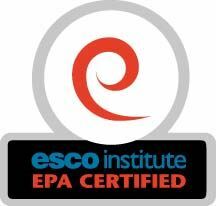 The certification test is administered by ESCO Institute, an EPA-approved certifying organization. Upon passing the test, the technician will receive a certificate and a wallet card from ESCO Institute. ESCO Institute will maintain a database of all technicians who have successfully passed the ESCO InstituteTraining Refrigerant Recovery test. A cancellation received up to seven  days prior to the class/exam will be charged a $35 cancellation fee. There is no refund for a cancellation within seven days of the class/exam or for failure to attend.